GHAZIABAD/NOIDA: Residents of western Uttar Pradesh have overwhelmingly supported Chief Minister Mayawati's move to break up Uttar Pradesh into four states. Ghaziabad Bar Association president Rakesh Tyagi said lawyers had been fighting for long for an Allahabad High Court bench in the region. "Now the chief minister has given us an entire (new) high court along with a new state," an elated Tyagi told IANS. "It is definitely a great gift to western Uttar Pradesh." Social activist Rajendra Tyagi added that Mayawati had opened the doors for the development of the sprawling western Uttar Pradesh, which borders Delhi. "Till now the entire record revenue from the region was being siphoned off to Lucknow and only a very small part was given to western Uttar Pradesh," he said. Tyagi said Ghaziabad had been deprived of a Metro train project because of Lucknow's callous attitude. Residents Welfare Associations Federation chairman Tejendra Pal Singh Tyagi said: "Mayawati's move is highly appreciable." Ghaziabad Industries Federation chairman Hariom Chauhan said Mayawati should have broken up Uttar Pradesh into two or three but not four states. "The central government has still not resolved the issues of Telangana and Vidharba," he said. "But for the development of western Uttar Pradesh, a new state is a must." Noida Lok Manch president Mahesh Saxena called it a "bold step". "We fully support this move. But the chief minister should have passed the resolution in the assembly with support from all parties," Saxena said. Noida Residents Welfare Association Federation president N.P. Singh felt that a new state of Western Uttar Pradesh would become the most prosperous state in India, leaving behind even Gujarat and Punjab. Vipin Malhan, president of the Noida Entrepreneurs Association (NEA), also gave his enthusiastic backing to the concept of smaller states. "G.B. Nagar district alone generates Rs.10,400 crore revenue which is invested in Eastern Uttar Pradesh," he alleged. "If Western Uttar Pradesh becomes a state, the entire revenue will be invested here. "Noida would be the best show window for India," Malhan added. LUCKNOW: The Uttar Pradesh assembly on Monday passed a resolution seeking to divide the state into four parts. The resolution was passed with a voice vote. The UP assembly was adjourned sine die immediately after the passage of the resolution seeking to divide the sate. Earlier in the day, the assembly was adjourned for an hour amid uproar created by SP, BJP and Congress MLA over no-confidence motion and resolution on division of UP. Contrary to constitutional norms, chief minister Mayawati was not present at the start of the session. As soon as the session started, SP served a notice of no-confidence claiming it has support of all the opposition parties and 70 ruling BSP MLAs. BJP has also served a no-confidence notice. The opposition demanded that no-confidence motion should to be taken up immediately and put for voting. Speaker Sukhdev Rajbhar assured the opposition that the no-confidence motion will be taken up later as per rules. However, opposition created ruckus forcing the Speaker to defer the session. BSP government wanted to first pass vote-of-accounts and then take up the no-confidence motion but opposition did not agree claiming that the government does not enjoy majority of the House and it has no right to conduct the House. SP said that as per rules no-confidence motion gets priority over other items in the agenda. The motion is part of SP's game plan to scuttle tabling of state reorganisation resolution. Mayawati government claimed it enjoys majority which it will prove again in the House. The two day winter session started on Monday. This is also the last session of the existing assembly. Next elections are due in March-April 2012. SP leader Azam Khan said that SP will oppose the resolution. SP leader Shivpal Yadav claimed his party has support of all opposition parties. However, RLD has supported state reorganisation proposal but said it will move a private bill in this regard. BJP has demanded that decision to split UP should be taken after threadbare deliberation over its viability. Party said that it supports UP's division but it should not be done in a hurry. On the other hand, Congress leader Pramod Tiwari said party will support no-confidence motion brought by a secular party, indicating it will not stand with BJP in the House. Tiwari also said that the resolution to reorganise UP into four states should include demand to constitute state reorganisation commission by the Parliament for division of UP. This, he said, will give resolution a legal validity, otherwise it will be a mere a 'politically motivated' statement of Mayawati. Meanwhile, the legislative council was deferred after opposition raised the issue of BSP rebel MLC Babu Singh Kushwaha, who has alleged that ministers and officers are conspiring to kill him. Kushwaha was close to chief minister Mayawati till April this year when he was made to resign after his name figured in NRHM scam and murders of three medicals related to it. Noida: The coveted tag of being the 'capital city' is now up for grabs with Uttar Pradesh chief minister Mayawati openly advocating the division of the state into four parts – Awadh Pradesh, Pashchim Pradesh, Poorvanchal and Bundelkhand. The twin cities of Noida and Greater Noida are hoping that either of them turns into the seat of power of Pashchim Pradesh. When TOI talked to residents of the two NCR cities, they said that while Noida has the evident problem of lack of room for expansion, the budding city of Greater Noida stood an ample chance of becoming the capital city if and when Pashchim Pradesh comes into being. Greater Noida, with its "strategic location, evolving infrastructure, connectivity, planned development and the successful F1 event," would be apt to be declared the capital. "The state government and the development authorities have succeeded in creating 21st-century twin cities of Noida and Greater Noida. With the burgeoning industries and ample trade opportunities, the two cities together are among the largest contributors to the state exchequer," said BSP member and Gautam Budh Nagar MP Surendra Nagar. "While choosing a capital city is the task of the government, it is too early to zero in on one city. 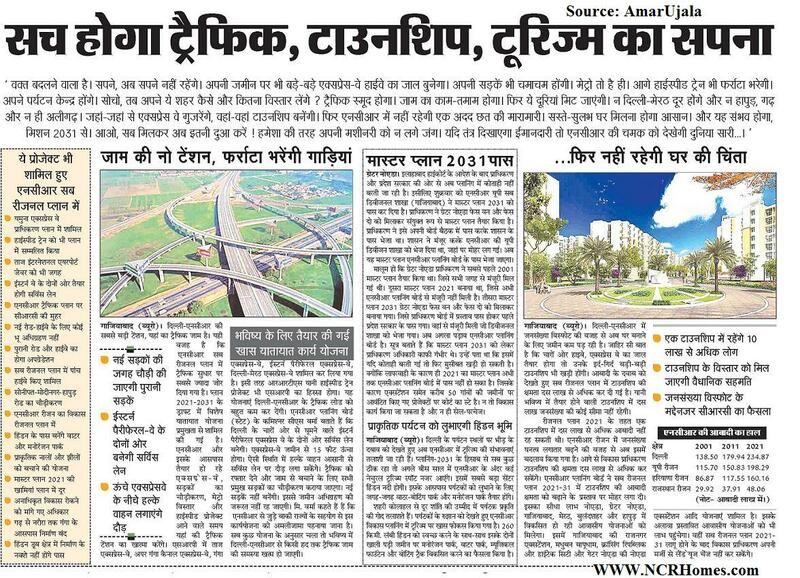 I can say that Greater Noida surely is shaping up as India's smartest city with a continuously evolving landscape for new development and construction," Nagar added. "Greater Noida with the proposed airport and the Bodaki railway station will make a perfect choice to be the capital of Pashchim Pradesh," added Satbir Gujjar, BSP MLA from Dadri. "Actually, the entire Gautam Budh Nagar district has emerged as an agricultural and industrial powerhouse for Uttar Pradesh, and Greater Noida has all the potential to act as the face of the new state," said Shakti Nath, CMD, Logix group. "With its integrated residential and industrial infrastructure, Greater Noida is fast developing into a successful landmark story. To top it all, the success of the recent F1 event shows that Greater Noida is the city of the future," he added.Ravi Mohan Sethi, a retired bureaucrat, said, "Smaller states can be governed better as it would be easier to concentrate on development and progress. If Pashchim Pradesh is formed, it will prove to be a strong entity with Greater Noida and Noida forming a formidable portion of the state. "According to Vipin Malhan, president of Noida Entrepreneurs Association, since its inception in 1991, Greater Noida has come a long way and become the "showpiece of Uttar Pradesh." "Today, the city is sprawling across 36,000 hectares and has emerged as a model of farsighted town planning. Availability of basic infrastructure is planned to exceed demand at all stages of development. The city is also dotted with open green spaces and parks. If the new state is carved out, development in both the state and Greater Noida as its capital will get an immense boost," Malhan said.The Master Plan 2021 for Greater Noida includes transport networks, highways, and six new link roads for better connectivity through the Upper Ganga Canal Expressway. Recently, the proposal for the Jewar Airport has been included in the new sub-regional plan of NCR UP. The connectivity is slated to increase manifold once the slew of proposed projects are completed and the Metro reaches Greater Noida. Greater Noida has also been proposed to be the gateway to the upcoming Delhi-Mumbai Industrial Corridor. Besides, most of the administrative machinery, including the collectorate, police lines and courts, are already set up in Greater Noida. Hailing the new proposal of smaller states, residents also feel that while Greater Noida has all the potential to become a capital city, the move will also go a long way in benefitting the city's overall growth. "While new investments in real estate and industries will flow in, at a micro level there will be a greater spurt in the development of shopping malls, entertainment hubs and retail stores for the convenience of residents as well," said Amit Bhatnagar, corporate affairs head at Metro hospital. Paschim Pradesh comes into being, Gautam Budh Nagar, comprising the twin cities of Noida-Greater Noida and Yamuna township, will be its financial capital. With a population of about 1.7 million, the district gives an annual revenue of Rs 10,000 crore to the state and the centre. Mayawati has, in her speeches, repeatedly referred to Noida as “very, very important”. Former UP chief secretary Yogendra Narayan said: “The Noida-Greater Noida region is a major contributor to revenue. It will benefit immensely if the move succeeds.” There are 15,000 industrial units in the two cities while annual per capita income is Rs 20,000. 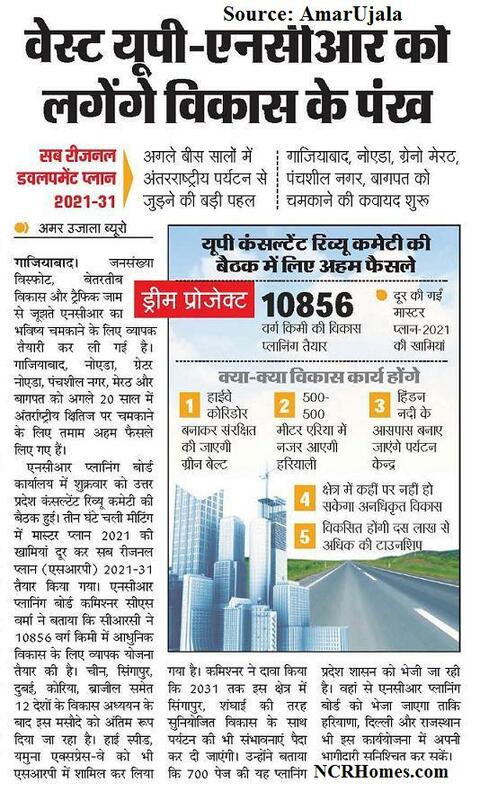 “The revenue generated in Noida is used for development across the state. Once we have a separate state, the money will be used for our development,” said Vipin Malhan of Noida Entrepreneurs’ Association. The Yamuna and Greater Noida expressways, DND Flyway and Metro have already taken care of road connectivity. The government has planned an aviation hub at Jevar and is spending Rs 10,000 crore on infrastructure development. New Metro lines, highways, elevated roads and bridges, and about 300,000 houses are being built. Residents too have struck discordant notes. “The move is political. We should think of the interests of a larger number of people,” said Girija Singh, resident of Sector 15. The proposed Purvanchal state in eastern Uttar Pradesh would get maximum 26 districts to be carved out of UP, if the ‘divide and rule’ policy of Mayawati government sees the light of day. In the election year, the UP Cabinet on Tuesday approved the proposal to divide UP in four separate parts for speedier economic development and better administration. The proposal would be tabled in the state Assembly session later this month for ratification before it could be forwarded to the Centre. The proposed four regions are Purvanchal (east UP), Bundelkhand, Awadh (central UP) and Paschim Pradesh (west UP). Currently, UP has 75 districts, 80 Lok Sabha seats, 403 Assembly seats, 200 million population and a geographical area of almost 2,41,000 sq km, big enough to a country in itself. According to the blueprint of division, Purvanchal would get the maximum 26 districts, followed by Awadh (21), Paschim Pradesh (17) and Bundelkhand (11). Purvanchal, which is one of the most economically backward regions in India, would comprise 78 million population, 158 Assembly and 31 Lok Sabha seats. The likeable capital could be Allahabad, Varanasi or Gorakhpur. Its prominent industrial and economic hubs include Varanasi, Sant Ravidas Nagar (Bhadohi), Mirzapur, Allahabad, Gorakhpur, Pratapgarh etc with carpet, silk, cloth, handicraft, sugar and power loom units forming its staple. 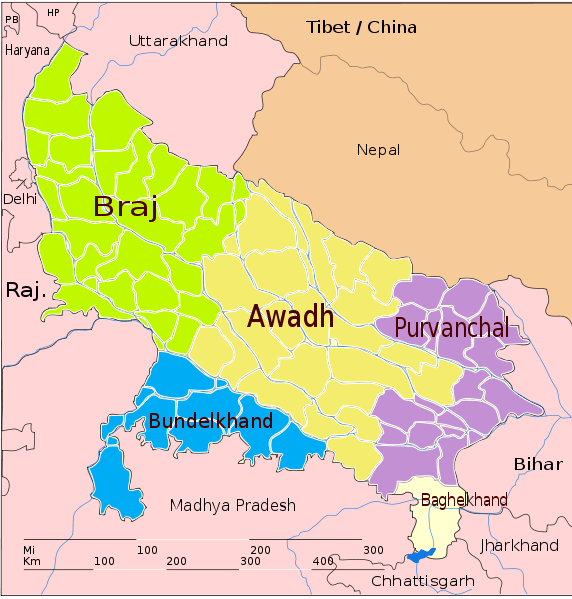 Awadh would comprise 57 million population, 121 Assembly and 25 Lok Sabha seats with the existing capital of UP continuing to the state headquarter. This region has several sugar mills, leather units, chikan and apparel manufacturing units, perfumeries, tobacco and glass units etc spread over Lucknow, Kanpur, Kannauj, Bareilly, Pilibhit, Unnao, Mainpuri, Ferozabad etc. Lucknow and Kanpur have a large concentration of commercial and educational institutions. Similarly, Paschim Pradesh, which the Ajit Singh-led Rashtriya Lok Dal (RLD) terms as Harit Pradesh, would get 44 million population, 89 assembly and 18 Lok Sabha seats. Meerut could be the capital. It is the most industrialised region in UP with industries spanning leather, footwear, IT, brassware, tool and machinery manufacturing, foundries, sugar, locks, automobiles, ancillaries of several big industries, woodworks, sports goods etc. The major industrial hubs are Meerut, Agra, Ghaziabad, Gautam Buddh Nagar, Saharanpur, Aligarh, Mathura, Moradabad etc. 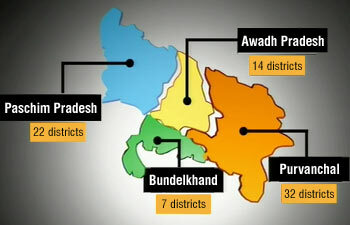 Bundelkhand would comprise 17 million population, 35 Assembly and 7 Lok Sabha seats. 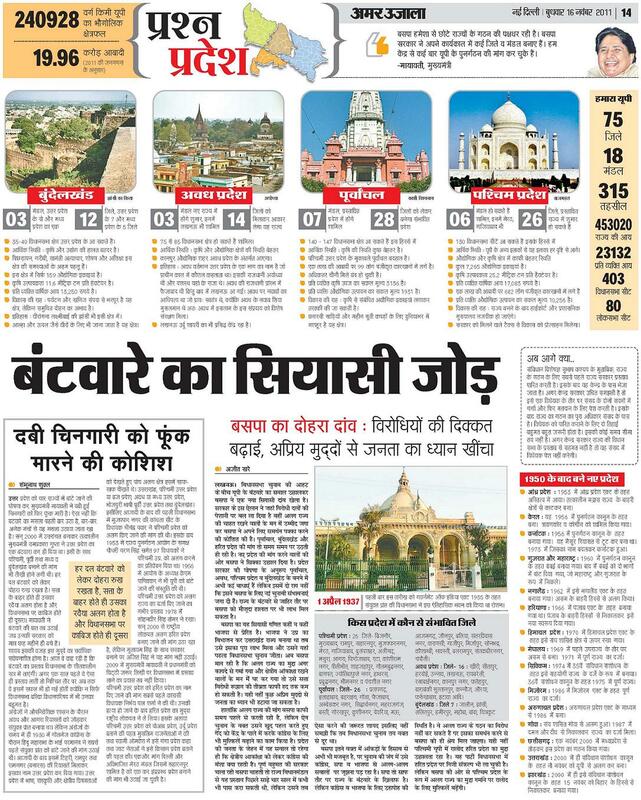 Jhansi or Banda could be selected as the capital if ever this arid region was carved out as a separate state. This region is minerals rich. The state has proposed to add four more districts viz. Auraiyya, Ramabai Nagar (Kanpur Dehat), Kaushambi and Fatehpur to the original seven districts in Bundelkhand namely Jalaun, Mahoba, Jhansi, Chitrakoot, Banda, Hamirpur and Lalitpur. Bundelkhand spans districts in UP and adjoining Madhya Pradesh, where about six districts comprise the whole region. Uttar Pradesh Chief Minister Mayawati on Tuesday pitched for the division of Uttar Pradesh into four smaller states — Avadh Pradesh, Poorvanchal, Bundelkhand and Pashchim Pradesh. Prominent cities under proposed state of Paschim Pradesh are Meerut, Bareilly, Aligarh, Ghaziabad, Moradabad and Noida. Addressing media in the state capital a day after Congress general secretary Rahul Gandhi formally launched party's campaign for 2012 assembly polls in Phoolpur, Mayawati, with a clear eye on votes, said that her Cabinet has decided to pass a resolution and send it to the Centre for approval. As the battle for Uttar Pradesh heats up, the BSP chief said that a resolution to divide Uttar Pradesh into four parts would be passed during the coming session of assembly, beginning on November 21. Mayawati said that smaller states would be easier to govern. "My government has started the process of dividing the state into four states… We shall seek approval of the legislative council in the upcoming session and forward the matter to the Centre," the chief minister said. LUCKNOW: Uttar Pradesh chief minister Mayawati on Tuesday announced that she would table the proposal to divide UP into four smaller states in the winter session of the state assembly starting November 21. The four parts will be – Poorvanchal (East UP), Paschhimanchal (West UP), Bundelkhand and Awadh (central UP). Mayawati got the proposal of dividing UP into four parts approved from her cabinet this morning and later annouced it at a press conference. The move is being seen as Mayawati's trump card for upcoming assembly elections. The move, political observers, believe has been taken to compensate for anti-incumbency, divert public attention from corruption charges against Mayawati and will put opposition parties on the backfoot. But opposition parties described the move as political stunt. Mayawati said that the decision to divide UP in four parts had been taken after hectic deliberations and threadbare analysis of its pros and cons. She said that smaller states could be managed in a better way in comparison to bigger ones. She said UP was backward mainly because of its huge size. She said she had created smaller districts in UP for better management. The chief minister said UP had given maximum number of prime ministers to the country but none of them contributed to development of the state. She said that as per the constitution, re-organisation, division and renaming of states could only be done by Parliament. She said that governments at the centre should have taken the decision of division of the state. But, she said, unfortunately neither BJP led NDA government, nor Congress led UPA government took any decision. Mayawati said that soon after taking charge of UP in 2007, she had asked Prime Minister to consider division of UP. She said that she also asked for Rs 80,000 crore package for development of east UP and Bundelkhand but the Centre had done nothing. However, she said that she kept on sending reminders to the Prime Minister for division of UP and development package hoping that the Centre would take a positive initiative. Mayawati said as per the procedure, UPA government should have passed a proposal of UP's division in Parliament and send it for consent of the UP assembly. "But after waiting for a long time, when the Centre did nothing, my government finally decided to bring the proposal of UP's division in the next assembly session and send it to the the Centre to mount pressure on the UPA government," she said. LUCKNOW: UP chief minister Mayawati is likely to announce the reorganization of Uttar Pradesh, splitting the sprawling state into four parts, in a move that her supporters are seeing as a poll-eve masterstroke. Well-placed BSP sources said Mayawati is planning to carve four new states out of the country's largest state which, with its 75 districts, is larger than many countries. As per the blueprint, the eastern part of the state with 32 districts will form a new state of Poorvanchal while the 22 western districts will be grouped together as Harit Pradesh. Bundelkhand will take seven districts while the remaining 14, all in central UP, will comprise the fourth. Mayawati did not deny the move when questioned by reporters at a press conference to announce the hike in state advisory price for sugarcane. A smiling Mayawati said, "It's a big issue but I will not talk about it today because if I do, you people will downplay the SAP story, a big pro-farmer step of the state government." This response strengthened the buzz around the reorganization. A division of UP has been talked about for long because of the problems involved in administering such a large area. The state remains unwieldy even after the hilly region was hived off to form Uttarakhand. But the move has gained momentum now because of the impending elections, with BSP sources hoping that it would set the agenda for the coming polls, while diverting attention away from the incumbency. The hope is not without basis because almost all political parties have at various times advocated division of the state into smaller units. Congress has been championing the creation of Bundelkhand on the ground that its distance from Lucknow has contributed to its backwardness. The party has not taken a stand on Harit Pradesh, but will find it difficult to oppose it because its prospective ally Ajit Singh has made it a battle theme. BJP, which carved Uttarakhand out of UP, has consistently prided itself for its commitment to smaller states — pointing to the creation of Chhattisgarh and Jharkhand in 2000. The party has now taken cudgels for the demand for Telangana. Samajwadi Party is categorical in its opposition to the splintering plan. Its general secretary Ram Gopal Yadav said, "The division will reduce UP's clout in national politics." BSP sources feel that SP's opposition will help Mayawati's plan to shape the narrative. Under the Constitution, the power to create new states is vested with Parliament. Constitution explains that the bill for creation of new states can be introduced in either House of Parliament on the recommendation of the President. If the bill affects the area, boundaries or names of any of the states, President would refer the bill to the legislature of the state for expressing its views within a stipulated period. The Congress, which is already caught in the row over separate state of Telangana, is unlikely to reveal its hand. Congress leaders said the party might support Mayawati's proposal but a final decision would be taken by the high command. In New Delhi, Congress did not oppose the move outright, merely saying it should be referred to a new State Reorganization Commission: a posture which only indicated its wariness of Mayawati's electoral intent. Although her timing has been influenced by the looming polls, Mayawati has kept the issue burning since winning the 2007 elections. She publicly supported the division of UP while addressing a rally in Lucknow, and followed that by writing to Prime Minister Manmohan Singh in 2008 and, again, in 2009. Most recently, she raised it in September while announcing the creation of three new districts in western UP. Even as bigger players were trying to craft their response, smaller outfits campaigning for statehood for distinct regions in UP were already celebrating the prospect. "We are getting support of the National Federation for New States, which includes outfits fighting for small states across the country," said Raja Bundela of Bundelkhand Congress. Former SP leader Amar Singh also announced that he would hold a rally on November 13 at Sarnath in Varanasi in support of the creation of Poorvanchal. Their excitement can only serve Mayawati's objective to distract attention. The BJP has been supporting smaller states but has chosen to downplay Mayawati's proposal. BJP's national vice-president Kalraj Mishra said the party had always been in favour of smaller states but the decision to divide UP should be taken after a thorough study by state reorganization commission. He also said BSP should make it clear whether it had any specific plan for trifurcation or was raising the issue only to arrest anti-incumbency and divert public attention from the corruption and breakdown of law and order under Mayawati's rule. BJP state president S P Shahi said, "We will open our cards after the state government tables the proposal in the state assembly." New Delhi: In a bid to counter Bahujan Samaj Party chief Mayawati’s plan to divide Uttar Pradesh, the Congress on Wednesday hit back saying the second State Reorganization Commission (SRC) be constituted first before such a move. He is also believed to have told reporters that the recommendations of the SRC would be important and it will also help in the equitable allocation of the central assistance required for the all-round development of newly carved states. Uttar Pradesh Chief Minister Mayawati wants the state to be trifurcated into Bundelkhand, Poorvanchal, and Paschimanchal (or, Harit Pradesh, or western Uttar Pradesh). Mayawati has already written to Prime Minister Manmohan Singh in this regard. Political observers see Mayawati’s demand as a move to counter the Congress party’s campaign to get stronger in Uttar Pradesh, which has put pressure on her. However, these observers believe that Mayawati certainly does not want the liquidation of Uttar Pradesh, which is her stronghold. It is possible that, through her demand for three new states, she is hoping that her party, the BSP, can rule three states, instead of one state in which the party is in power now. Political analysts are of the opinion that the big size of the state makes its governance difficult with the state stretching from the outskirts of Delhi to Bihar, and touching Madhya Pradesh, Haryana and Rajasthan. In 2001, a new state called Uttarakhand was carved out of the prized hilly regions of Uttar Pradesh. At present, Uttar Pradesh has 80 Lok Sabha constituencies – which means there are 80 Members of Parliament, and thus the state becomes a deciding factor in the formation of any government at the Centre. The Congress and the BJP have severely criticized Mayawati for having written a fresh letter to the Prime Minister demanding its trifurcation. Pramod Tiwari, leader of the Congress Legislature Party in Uttar Pradesh Assembly, dubbed Mayawati’s move as a “political gimmick”. Hriday Narain Dixit, vice-president of the Uttar Pradesh unit of the BJP, slammed Mayawati for writing letters to the Central government “for all problems”. Meanwhile, Ajit Singh, the president of the Rashtriya Lok Dal (RLD), has threatened to launch an agitation if the demand to form Harit Pradesh out of western Uttar Pradesh is not met. Lucknow: The Congress has decided to support Uttar Pradesh Chief Minister Mayawati if she brings the proposal for the trifurcation of the state. According to party sources, the Congress has called for setting up a second State Reorganisation Committee (SRC) for the purpose. In case the trifurcation of the state is done, Uttar Pradesh will be divided into three parts – Harit Pradesh, Bundelkhand and Purvanchal. Notably, Congress general secretary Rahul Gandhi has already voiced his support for the creation of Bundelkhand. Rashtriya Lok Dal (RLD) chief Ajit Singh has also been aiming for the creation of Bundelkhand. Meanwhile, the state unit of the Congress is also in talks with Ajit Singh for a possible alliance with the RLD in the Uttar Pradesh elections. Uttar Pradesh (UP) chief minister Mayawati has an ace up her sleeve that will enable her to launch an offensive against her opponents — the Congress, Samajwadi Party (SP) and the BJP — while campaigning for the assembly polls, scheduled for March 2012. Sources within the Bahujan Samaj Party (BSP) say Mayawati plans to table a resolution in the assembly for the division of UP into four parts — west UP, east UP, Bundelkhand and central UP. 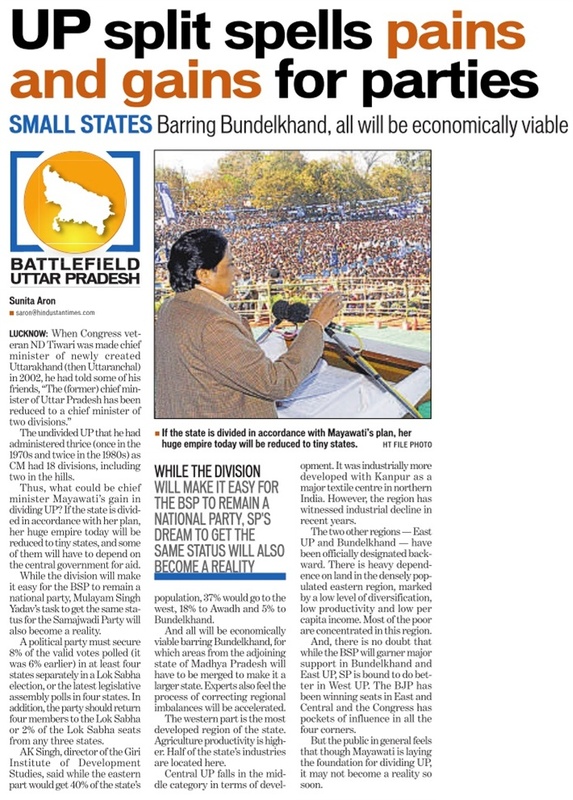 Mayawati had always supported the idea of smaller states but was waiting for the right time to push for her demand. The resolution is likely to be tabled on November 21 in the UP Vidhan Sabha in the winter session — the assembly’s last session before the state goes to polls. Mayawati’s arch-rival, SP chief Mulayam Singh, is vehemently against the division of UP. However, Mayawati is unlikely to face hurdles in getting the resolution passed as the BSP enjoys a comfortable majority in the state. Political insiders say the move will put the ball in the Centre’s court and it would be difficult for Congress leaders to answer questions on UP’s division during the campaign. BSP sources said Mayawati will question her opponents on why they did not do anything for the division of the state despite having ruled UP for many years. This will help Mayawati to cash in on the regional aspirations of people who have been agitating for separate states within UP — which has a population of over 20 crore. Though Mayawati has in the past written to the prime minister advocatingthe division of UP, this would be the first time she would take a decisive step in that direction. “The situation in Bundelkhand is such that no candidate, regardless of party affiliations, will be able to campaign in the region without supporting the demand for a separate state,” said Raja Bundela, who has been agitating for a separate state under the banner of the Bundelkhand Congress. “We will contest all 37 seats in the region and no government formation would be possible without our support,” he said. Apart from his party, other local groups such as the Bundelkhand Nirman Morcha, Bundeli Sena, Bundelkhand Vikas Sena and Bundelkhand Liberation Front have been demanding separate states within UP. However, East UP or Purvanchal with 32 districts is yet to see a decisive agitation for a separate state. Some months ago, Amar Singh started a padyatra supporting the cause. His yatra earned him an impressive following, but the campaign weakened after he was jailed in the cash-for-votes scam. The 2012 elections in Uttar Pradesh promises to be the mother of all battles. It’s a four-way fight, with Mayawati’s Bahujan Samaj Party (BSP), the Samajwadi Party, the Congress-Ajit Singh combine and the BJP being the principal contenders. From all accounts, Mayawati seems to be under pressure, but given the caste and religion combos being planned to woo voters from four different directions, no one can say she will not win. In fact, it seems she has her own plans to deflect allegations of corruption and reset the agenda to her advantage. Her trump card, according to DNA (Daily News & Analysis) newspaper, is that she plans to announce a division of Uttar Pradesh into four states. This will be the cornerstone of her strategy. The newspaper, quoting unnamed sources, says that Mayawati’s party will table a resolution in the UP assembly on 21 November to divide the state into four parts – Western UP (Harit Pradesh), Central UP, Bundelkhand, and Eastern UP (Purvanchal). The broad thinking behind this strategy – if it happens as forecast – is to stoke regional aspirations and shift the focus away from her own failings over the last five years. There is a good chance it could work. It would – at the very least – divide her opposition. While Mulayam Singh’s party – now run by his son Akhilesh – has in the past been opposed to dividing the state, the BJP has always supported the idea of smaller states, while Congress ally Ajit Singh wants a Harit Pradesh in western UP’s Jat belt. If the Samajwadi party is caught in a bind and Ajit Singh suddenly sings a different song from what the Congress has scripted, the two main challengers to Mayawati’s rule will be in a state of confusion. 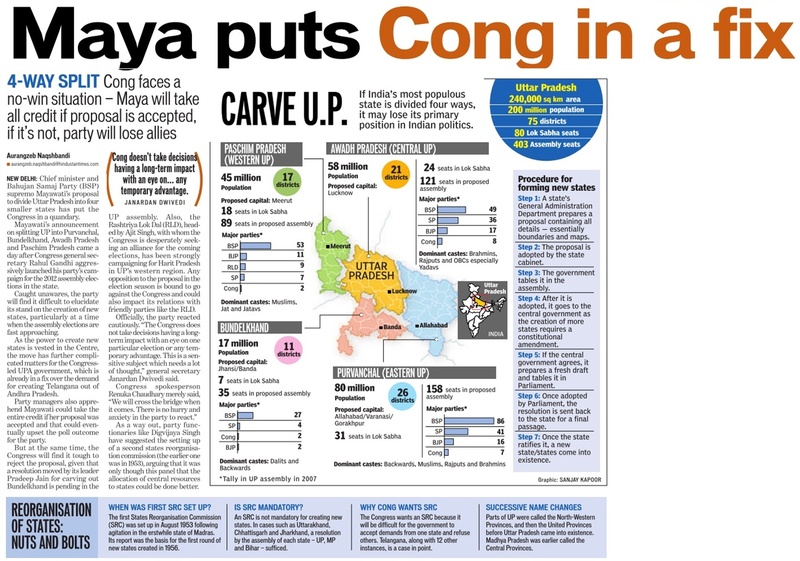 The Congress has been wishy-washy on the idea of smaller states (witness the flap over Telangana), while Amar Singh – who has fallen out with Mulayam Singh – has, in the past espoused the cause of a separate Purvanchal. This could gather steam even in his absence, affecting the Samajwadi party’s hopes in eastern UP. If regional aspirations are going to be used to under-cut the traditional caste-religion combinations that the parties are currently relying on, the poll race could be turned on its head. Here’s a first-cut analysis of the current gameplans of the various combines and what Mayawati’s gambit could do to them. Mayawati’s BSP: By proposing a division of the state, Mayawati’s main gain is that she can shift the focus of debate from anti-incumbency to regional aspirations. Her core support base of Dalits and ultra backward castes may remain intact despite Rahul Gandhi‘s occasional efforts, but the Brahmin-upper caste vote will be tough to retain if the BJP gets its act right or if the Congress is seen as an alternative. A four-way split in UP means that there is scope for creating more chief ministers in future. And this could solidify support within her own party, since there is now the possibility of breaking through the glass ceiling in the BSP created by having Mayawati as irreplaceable head. More states means more jobs for politicians. Congress-Rashtriya Lok Dal (Ajit Singh) alliance: This alliance is likely to be most adversely affected by the Mayawati strategy, especially since its expected gains in Western UP will be collared by Ajit Singh – who may have ambitions of becoming CM in his stronghold. The Congress will also have trouble reinventing the old upper caste-Dalit-Muslim combine that kept it in power for so long – and which Mayawati has tried to recreate in her own way, but with Dalits leading the upper castes and a small support base among Muslims. Samajwadi Party: From all accounts, Akhilesh Yadav’s rise as heir-apparent to the ailing Mulayam Singh Yadav is happening smoothly. His key test is to retain the old Yadav-Muslim alliance in order to dethrone Mayawati. He also has to use the anti-incumbency factor to catapult his party to a better performance. The proposal to split UP is a complication he could do without, since it will confuse issues in the March poll. Moreover, with the Congress making a bid for the Muslim vote, he has to guard his flanks. But as of now, the MY — Muslim-Yadav — combo is more or less intact. BJP: As the only party without a clear gameplan for Uttar Pradesh, and with no allies to boot, the BJP could be in danger of seeing a further erosion in its support base. It will have to re-energise its troops by trying to regain the old upper caste vote bank and segments of the OBCs – as the selection of Uma Bharti to head the campaign in the state suggests. Mayawati’s plan to split the state is to the BJP’s theoretical advantage, but the party is yet to draw up its strategy. It has miles to go. In sum: Mayawati’s new divide-the-state-and-rule strategy could give her a small edge, but whether it is enough to overcome the anti-incumbency factor or not depends on how the other players play their cards on this issue. Uttar Pradesh Chief Minister Mayawati is all set to bring a resolution in State Assembly seeking trifurcation of the state into Bundelkhand, Harit Pradesh (West UP) and Poorvanchal Pradesh (East UP). The state Cabinet, which met here on Thursday, has endorsed the proposal for convening the winter session of the Legislature from 21 November. UP has a bicameral Legislature which includes State Assembly and the Legislative Council. This is likely to be the last session of the Legislature as UP goes to Assembly polls in early 2012. The 16th or the next Assembly has to be constituted by 13 May, 2012. However, political observers see it as a clever move by the BSP. “Mayawati hopes to not only corner her arch-rival Samajwadi Party–which is opposing the division of UP–but also deflect the focus on her performance and blame the Congress led UPA government at the Centre for not delivering to the people of Bundelkhand, West UP and East UP,” said political analyst Ashutosh Mishra. The Congress is opposed to further division of UP. Hill state of Uttrakhand was carved out of UP in November 2000 during the BJP-led NDA rule at the Centre. For the trifurcation of UP, Mayawati had set the ball rolling on 9 October, 2007, while addressing a big party rally in Lucknow on the first death anniversary of her mentor Kanshiram. Mayawati had then said that for accelerating the pace of development and improvement in overall quality of governance in backward areas of the state, her party favoured the division of UP into Bundelkhand, Harit Pradesh and Poorvanchal Pradesh. Mayawati had, however, then said that her government was ready to get a resolution to this affect passed by the Assembly provided the Centre gave approval. The Congress had then maintained silence on the issue, the BJP had supported the division while the Samajwadi Party, the principal opposition party in UP, had opposed the idea. In March 2008, Mayawati again raked up the issue and wrote to Prime Minister Manmohan Singh urging him to give green signal for carving out the new states. She again wrote to the PM in December 2009 that “since the Centre has already given nod for carving out the state of Telangana out of Andhra Pradesh, there was good enough reason to follow the same exercise in the case of UP, where the demand for new states of Bundelkhand in southern UP, Harit Pradesh in western UP and Poorvanchal Pradesh was being raised for a long time”. While political observers felt that the move was aimed at creating greater discomfort for the UPA government at the Centre, which is already grappling with the gradually increasing demand for statehood from different corners of the country, Mayawati sought to justify her demand by stressing that she had had these views for long. “I was always in favour of smaller states as they are much simpler to govern, and I have expressed these views on several occasions’’, she said in 2008. Mayawati had then also appealed to the people of the three regions and urged them to “not to indulge in any activity that is likely to disturb law and order in the state”. She assured to “extend full support to the popular demand of the people” of these areas. Mayawati, since her first tenure as Chief Minister, has created over 20 districts. In her bid to fight anti-incumbency and her dwindling electoral fortunes, she had announced the creation of three new last September. The BSP government, by convening the winter session, has also ensured that it will not have to face Governor BL Joshi in the Assembly. The last four years of Mayawati’s tenure have been marked by a series of scams like the National Rural Health Mission, which led to the killing of three doctors. The case is being investigated by the CBI on the directions of the Allahabad High Court. Besides, close to a dozen ministers have been indicted by the Lokayukta on serious charges of corruption and many are being investigated by the Ombudsman. The tainted BSP government in its bid to avoid the joint address to the state Legislature by the Governor, which is followed by a debate in both the houses over the performance of the government, has convened the last session in November itself. Usually, the winter session of the UP Assembly is convened in January, which is also the budget session. If the government convenes the winter session in January, it would begin with the joint address to both the houses by Governor. The Governor’s address is prepared by the state government, which outlines policies and priorities of the government. After the joint address to the state Legislature, both the houses debate on the address for at least four days. The debate ends with the reply of the Chief Minister followed by a motion of thanks to the Governor’s address. Obviously, the government would have to face the scathing criticism of the Opposition ahead of the Assembly polls if the winter session is held in January. “No government would like to face censure by the Opposition on the floor of the Assembly–that too ahead of the elections. But an unhealthy parliamentary precedent is being set in our democratic polity where governments are avoiding the Legislature to escape accountability towards the people,” said Rajendra Pandey, former Principal Secretary of UP Assembly. Interestingly, the previous Samajwadi Party-led government of Mulayam Singh Yadav too had avoided the-then Governor TV Rajeswar’s joint address. In 2006, the session of the State Assembly was convened in October and it continued till January and government transacted necessary official and legislative business. The resolution for the division of the state is also likely to bring the Finance Bill for seeking vote on account for the first six months of the next financial year. This is an established convention in all State Assemblies and Parliament, where a Finance Bill seeking vote on account for meeting the non-plan committed expenditure like salary, pension and debt servicing is sought by the outgoing government. 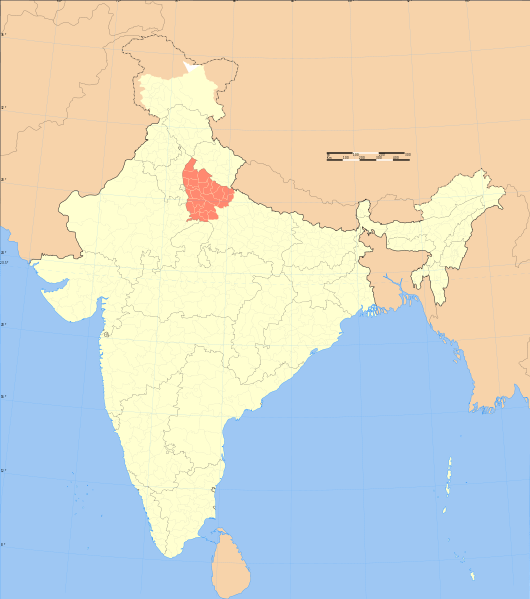 Harit Pradesh (Hindi: हरित प्रदेश, Urdu: ہرِت پردیش) is a proposed new state of India comprising the western parts of Uttar Pradesh state.Braj Pradesh (ब्रज प्रदेश) and Pashchim Pradesh (पश्चिम प्रदेश) are alternative names that have been proposed, because the region incorporates the historic region of Braj and is the western (pashchim in Hindi) part of Uttar Pradesh respectively. Braj Pradesh, however, is a term that has historically been used for parts of the proposed state's territory as well as some adjoining regions of Rajasthan state. Usage of that term by authors or politicians doesn't necessarily denote support for the movement to create a separate state. Uttar Pradesh is a large state, and "the cultural divide between the east and the west is considerable, with the purabiyas (easterners) often being clubbed with Biharis in the perception of the westerners. "[At the village level, some commentators have observed that Western Uttar Pradesh resembles Haryana and Rajasthan more than it does Eastern Uttar Pradesh, and the eastern region resembles Bihar more than it does Western Uttar Pradesh. Also, due to the successes of the Green Revolution, Western Uttar Pradesh has experienced both economic and social development, in a fashion similar to Haryana and Punjab. Eastern Uttar Pradesh, like Bihar, has not benefited to the same extent. The resulting disparity is believed to be partially responsible for the demand for separate statehood in Western Uttar Pradesh. In his 1955 critique of the proposed States Reorganisation Act, Thoughts on Linguistic States, B. R. Ambedkar had advocated the division of Uttar Pradesh into three states – Eastern, Central and Western, with capitals at Meerut, Kanpur and Allahabad respectively – in order to prevent excessively large states from dominating politics at the national level. The act was passed in 1956, however, keeping Uttar Pradesh intact as a single state. Later, in 1972, fourteen MLAs in the Uttar Pradesh state assembly moved an unsuccessful resolution to divide the state into three units (Braj Pradesh, Awadh Pradesh and Purbi Pradesh). In recent decades, Uttar Pradesh has seen the economic and political rise of the Yadav community, which has a large population and spread in Uttar Pradesh. The Jats, who are a dominant agricultural community spread across Pakistan, Punjab, Haryana and Western Uttar Pradesh, have found themselves in a "politically disadvantageous position" in Western Uttar Pradesh due to this increasing influence of the Yadavs. A separate Harit Pradesh would likely become a prosperous smaller state similar to Haryana and Punjab, under greater political control of local ethnic groups, such as the Jats, Tyagis, Gujjars, Jatavs (almost 12% of the population) and Muslims. Yadavs would have a strong continuing presence in the area as well. The most prominent current-day advocate for the creation of the new state is Ajit Singh, the leader of the Rashtriya Lok Dal party and a Jat. Other Jat leaders, such as Om Prakash Chautala of neighboring Haryana state and the leader of the Indian National Lok Dal have also made efforts to involve themselves in the politics of creating a separate state. Since the Muslim population in Western Uttar Pradesh (25%-34%, according to various sources) is higher than in Uttar Pradesh as a whole (17%), the Harit Pradesh proposal has found support from Muslim-affiliated organizations. Of the other main political forces in Uttar Pradesh, the Bahujan Samaj Party has supported the demand in principle, the Samajwadi Party has opposed it, and the Indian National Congress and the Bharatiya Janata Party have adopted a non-committal stance. From the Bahujan Samaj Party, Mayawati and DP Yadav have been vocal about their support. Rashtriya Lok Dal alleges that "Western UP contributes to a large chunk – nearly 72% – of the state's total income. In turn, what western UP gets is not enough. Just 18% of the state's budget is spent on developing west UP. This anomaly, understandably, makes the people of this area dissatisfied".The creation of three new states in 2000 (Jharkhand from the division of Bihar, Uttarakhand from the division of Uttar Pradesh and Chhattisgarh from the division of Madhya Pradesh) gave new impetus to the demand for Harit Pradesh. It shares borders with the current states of Uttarakhand, Haryana, Delhi, Rajasthan and Madhya Pradesh, as well as a brief international border with Nepal in Pilibhit district.